The longevity of dental restorations is dependent on many factors, including those related to materials, the dentist, and the patient. Dental amalgams have successfully served the profession for over a century. The main reasons for restoration failure are secondary caries, fracture of the bulk of the restoration or of the tooth, and marginal deficiencies and wear. The importance of direct-placement, aesthetic, tooth-colored restorative materials is still increasing. 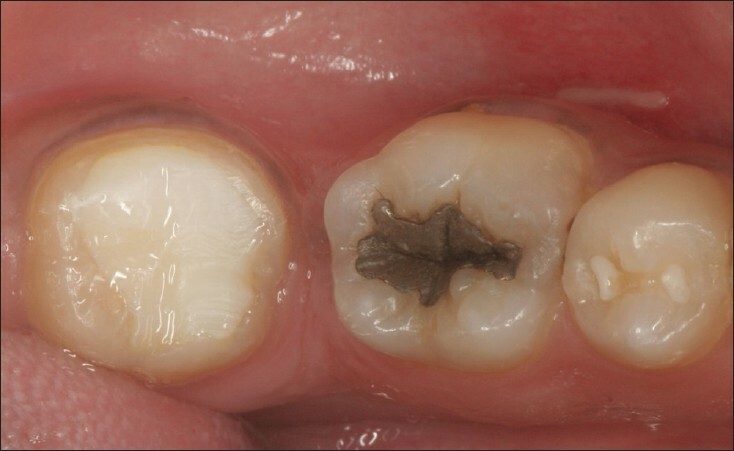 Amalgam restorations are being replaced because of alleged adverse health effects and inferior aesthetic appearance. All alternative restorative materials and procedures, however, have certain limitations. This article will attempt to critically analyse both amalgams and resin based composites, through an evaluation of scientific literature. 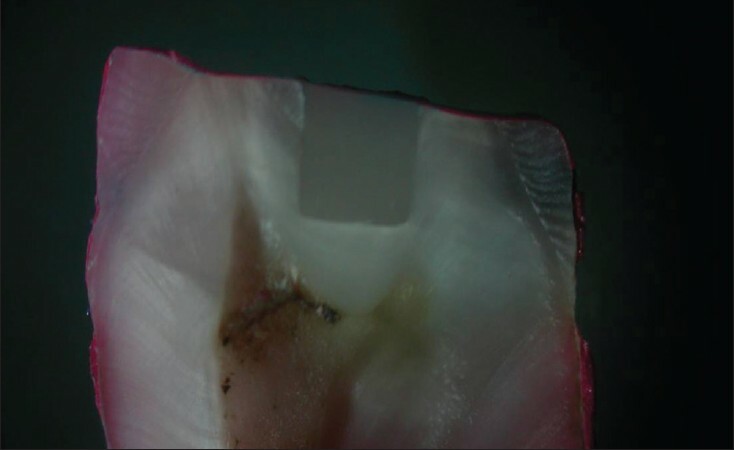 Objective: This study evaluated the marginal leakage around class-I cavity preparations restored with Nanofilled composite (Filtek Z-350 A2 shade, 3M ESPE, USA) and a self-etch adhesive (Xeno III, DENTSPLY/Caulk) using different composite placement techniques. Materials and Methods: Standardized class-I cavities were prepared on 36 caries-free, extracted human premolars and were randomly assigned to three groups: (1) Horizontal incremental curing was done; each increment of thickness 1.5 mm was cured one after the other using curing unit (T-LED, Elca Technology, Italy). (2) Concave surface was obtained with a ball burnisher on the first increment and cured for 20 seconds; subsequently, the next increment was placed and similarly cured. (3) Cavities were filled with resin, short of the occlusal surface; two cuts (mesiodistal and buccolingual) were made through the condensed resin and cured for 20 seconds, followed by addition of resin in the gaps created by the cuts and additional curing for 20 seconds. The specimens were stored in distilled water for three months and then subjected to thermocycling, followed by immersion in 0.5% methylene blue dye for 24 hours. The teeth were sectioned longitudinally and evaluated for microleakage under stereomicroscope, and the scores obtained were analysed with Fisher Exact test and Kruskal-Wallis nonparametric test. Results: There was no statistically significant difference among three groups. Conclusion: None of the techniques was capable of eliminating the microleakage in preparations with a high C-factor. Aim: To study the concentration of stress in class V restoration of four different restorative materials subjected to occlusal load of 100N, 150N, 200N, 250N and to analyse the obtained data with the listed properties of the restorative material. 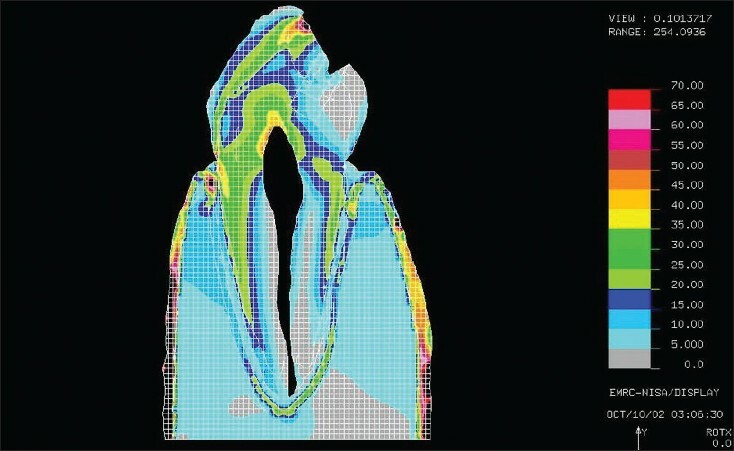 Materials and Methods: Using FEM analysis the stresses generated in a class V lesion in a mandibular premolar was studied. Results: Within the framework of the aforementioned views, and from the results of the study it can be concluded that microfilled composite is the most suitable restorative material followed by flowable composite, glass ionomer cement and resin modified glass ionomer cement. Conclusion: Restoration of Class V lesions with materials of higher modulus of elasticity will enable better stress distribution. Background and Objectives: To investigate whether salivary contamination during various stages of the bonding procedures of Xeno III and Clearfil SE Bond influences shear bond strength. Materials and Methods: The occlusal surfaces of thirty six maxillary premolar teeth were ground and divided into two groups containing eighteen specimens each, which was subdivided into three sub groups: Group I - Xeno III, Group II - Clearfil SE Bond, Subgroup A - Uncontaminated (control), Subgroup B - Contaminated with saliva before application and light curing, Subgroup C - Contaminated with saliva after light curing. Composite resin Filtek Z350 was packed using Teflon mold cured and subjected to shear bond strength analysis using universal Instron machine. Results: Statistical analysis was made using One-way ANOVA and Tukeys HSD test. Clearfil SE Bond showed very high statistically significant reduction in the bond strength, when salivary contamination took place after light curing; whereas, Xeno III showed very high statistically significant reduction when salivary contamination took place before application and light curing. Conclusion: Clearfil SE Bond showed more tolerance to salivary contamination of dentin and higher shear bond strength value, when compared to Xeno III. Periodontal attachment loss in the maxillary anterior region can often lead to esthetic and functional clinical problems. Lifelong motivation is essential to the supportive therapy for these patients, and the maintenance of good esthetics, combined with conducive to maintaining long term dental and professional health. 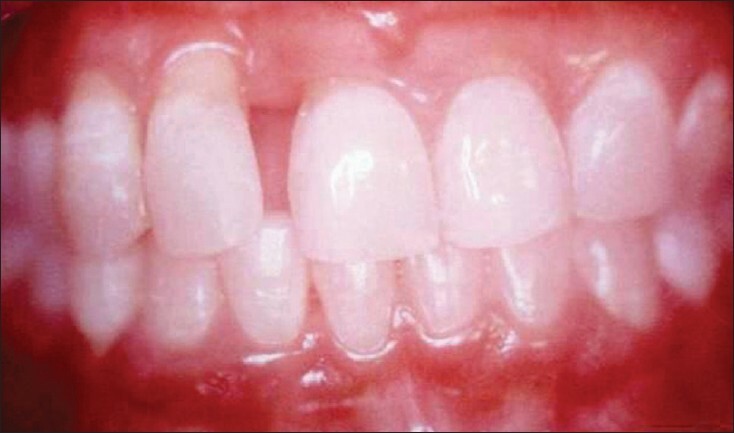 This paper aims to demonstrate an innovative treatment option for dealing with aesthetic challenges posed by a number of patients who have undergone initial cause related therapy for aggressive periodontitis.